Inquiring into childhood is one of the most appropriate ways to address the perennial and essential question of what it is that makes human beings – each of us – human. 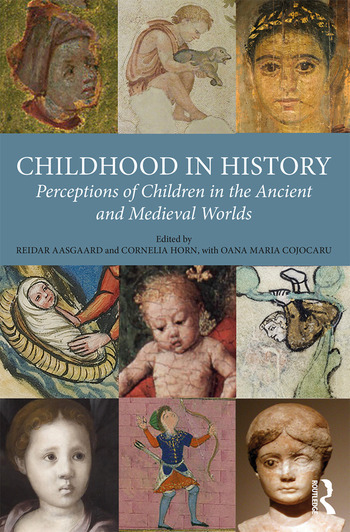 In Childhood in History: Perceptions of Children in the Ancient and Medieval Worlds, Aasgaard, Horn, and Cojocaru bring together the groundbreaking work of nineteen leading scholars in order to advance interdisciplinary historical research into ideas about children and childhood in the premodern history of European civilization. The volume gathers rich insights from fields as varied as pedagogy and medicine, and literature and history. Drawing on a range of sources in genres that extend from philosophical, theological, and educational treatises to law, art, and poetry, from hagiography and autobiography to school lessons and sagas, these studies aim to bring together these diverse fields and source materials, and to allow the development of new conversations. This book will have fulfilled its unifying and explicit goal if it provides an impetus to further research in social and intellectual history, and if it prompts both researchers and the interested wider public to ask new questions about the experiences of children, and to listen to their voices. Reidar Aasgaard is professor of intellectual history at the University of Oslo, Norway. He has published numerous books and articles on the New Testament, early Christianity, Christian Apocrypha, Augustine, and children and the family in antiquity. He is director of the research project "Tiny Voices from the Past: New Perspectives on Childhood in Early Europe". Cornelia Horn is full professor of Christian Oriental studies at the Martin-Luther-University in Halle, Germany. She has published extensively in the fields of religion, literature, history, and society in the Mediterranean world, focusing in particular on women, children, extracanonical traditions, interreligious relations, and Syriac and Arabic Christianity. Oana Maria Cojocaru earned her PhD degree in intellectual history (Byzantine studies) at the University of Oslo, Norway. Her doctoral thesis, which is part of the research project "Tiny Voices from the Past: New Perspectives on Childhood in Early Europe", deals with representations of children and childhood in medieval Byzantine hagiography.